In honor of all the women and men who serve, we offer an online discount entry fee ($5 off the 5k) for all law enforcement, emergency responders and military. Online registration opens Wed. Nov. 14, 2018 and closes Tues. Nov. 5, 2019. On site registration is available for the 5k at packet pickup on both Friday and Saturday. 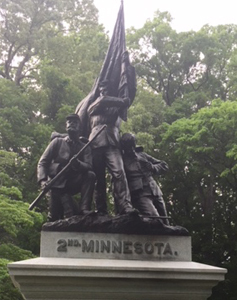 Each year the 5k finisher's medal features a different state monument located in the battlefield. The 2019 medal will be announced later. The 5k route starts and finishes at the 6th Cavalry museum. The course has been certified by USATF (Certification # GA14072WC). The 5k will use IPICO Sports timing tags. Runners will receive both a gun time and chip or net time. Overall winners and Age Group Awards will be based on gun time. A pasta dinner will be held on Friday Nov. 8 from 5:30 pm to 8:00 pm at the site of the packet pickup (First Baptist Church of Fort Oglethrope at 2645 LaFayette Road, Fort Oglethorpe, GA 30742). Special awards will be given to the overall male and female winners, as well as the male and female masters (40+) winners, the male and female grandmasters (50+) winners, and the male and female senior grandmasters (60+) winners. Awards will also be given to the top three finishers, both male and female, in the following age groups: 14 & Under, 15-19, 20-24, 25-29, 30-34, 35-39, 40-44, 45-49, 50-54, 55-59, 60-64, 65-69, 70 & over. Overall winners will be based on gun time. Age group awards will be based on gun time. All finishers of the 5k will receive a commemorative marathon finisher's medal. The 5k awards ceremony will be held at 9:30 am (EST). If you will be receiving an award, please plan to stay for the presentation as awards will not be mailed. The start/finish is located at the 6th Cavalry Museum in Fort Oglethorpe, Georgia (6 Barnhardt Circle). Please note, on-site parking closes at 6:45 am.